Discovering the Serenity of the Last Frontier. Alaska's Camping Guide is going through an exhaustive update to correct much of the outdated information previously found on this site. 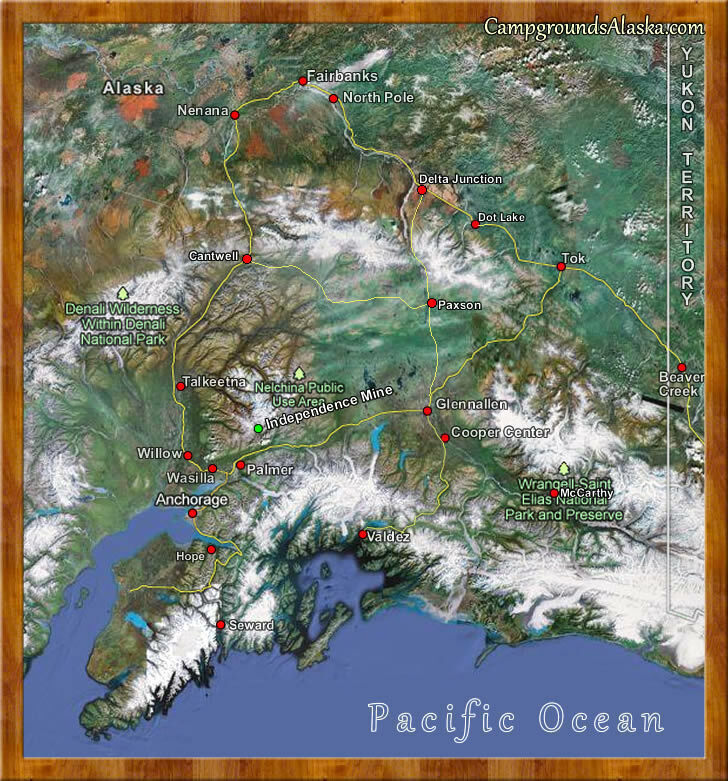 Alaska Road Maps available free of charge at the Visitors Centers in British Columbia and the Yukon. Find road maps for Alaska Highways and more including information of the paved roads in the State of Alaska. Alaska Road Map of the Highways that make up the Circle of Discovery. Alaska road map with the major highways in Alaska and the Yukon Territory of Canada. Road maps of the Alaska Highway are available online or free from the visitors centers in Alberta, British Columbia and the Yukon Territory. Pick up your Alaska Recreational Road Maps and start planning your trip today. ALASKA HIGHWAY This highway stretches from Mile 0 at Dawson Creek, B.C., through the Yukon Territory to Delta Junction, Alaska, a distance of approximately 1,500 miles. At Delta Junction, the Alaska Highway joins the Richardson Highway to continue on to Fairbanks and other Interior locations. This highway is no longer considered a wilderness road, but a road through a wilderness. The highway is, for the most part, asphalt-surfaced with ongoing improvements. DALTON HIGHWAY This is the road to the top of world. This 414-mile gravel road parallels the northernmost portion of the Trans-Alaska Pipeline. At about mile 116, you'll cross the Arctic Circle. Amenities are limited, but expansive vistas, blooming tundra and abundant wildlife combine to make this a spectacular journey. Public access is not allowed through the oil fields to the Arctic Ocean. DENALI HIGHWAY This 135-mile long highway connects Paxon on the Richardson Highway with milepost 210 of the George Parks Highway. There numerous informal campsites on the road, many trails and a great many archaeological sites in the Tangle Lakes area. EDGERTON HIGHWAY From the Richardson Highway, you can Join the Edgerton Highway for a beautiful 35-mile drive through Chitina to the start of the McCarthy Road which leads to the Kennicott River. ELLIOT HIGHWAY This highway leaves the Steese Highway 11 miles north of Fairbanks and travels 152 miles to Manley Hot Springs. The first 28 miles are paved, the rest is improved gravel roadbed. GEORGE PARKS HIGHWAY This highway connects Fairbanks and Anchorage and is named after a territorial governor of Alaska. The highway is 358 miles long and runs through some the grandest and most rugged land in Alaska. This highway provides direct access to Denali National Park and Preserve which contains Mt. McKinley, the tallest mountain in North America. GLACIER HIGHWAY Mostly in British Columbia, the Glacier Highway connects the Cassiar Highway at Meziadin Junction to the towns of Stewart British Columbia and Hyder Alaska. GLENN HIGHWAY The Glenn Highway covers 179 miles from Anchorage to Glennallen on the Richardson Highway. The highway continues This route is 328 miles and crosses Tahneta Pass into Palmer and the Matanuska-Susitna Valley, home of the Alaska State Fair. GLENN HIGHWAY (TOK CUTOFF) COVERS 125 miles from Gakona Junction (on the Richardson Highway, 14 miles north of Glennallen), to Tok on the Alaska Highway. HAINES HIGHWAY (Haines, Alaska to Haines Junction, Yukon Territory and there joins the Alaska Highway). This highway is 151 miles long, open year round, paved, and follows the original Dalton Trail into the Klondike Gold Fields. Spectacular scenery, and the famous bald eagle preserve, on this route that also connects with the Alaska Marine Highway System and is a popular loop for RV's connecting Skagway to Haines Alaska. KLONDIKE HIGHWAY connects Skagway Alaska to the Alaska Highway just south of Whitehorse Yukon. The Klondike Highway connects one of our favorite destinations, the town of Skagway to Dawson City, Yukon. This route somewhat parallels the route used by prospectors in the 1898 Klondike Gold Rush. From Dawson City, Yukon you can cross the ferry into Alaska at Boundary where the highway turns into the Taylor Highway. PORTAGE GLACIER HIGHWAY The Portage Glacier Highway is also often referred to as the Road to Whittier Alaska and connects the Seward Highway to the Begich, Boggs Visitor Center before traveling through the 2 mile long Whittier Tunnel that it shares with the Alaska Railroad for access to the seaside port of Whittier Alaska. RICHARDSON HIGHWAY The Richardson Highway covers 368 miles and connects the port of Valdez to the interior city of Fairbanks, Alaska. The Richardson Highway is marked as Alaska Route 4 from Valdez to Delta Junction and as Alaska Route 2 from Delta Junction to Fairbanks. Delta Junction is the official terminus of the Alaska Highway. SEWARD HIGHWAY The Seward Highway is a highway in the U.S. state of Alaska that extends 125 miles from Seward to Anchorage Alaska. The Seward Highway is designated a National Forest Scenic Byway, All-American Road and Alaska Scenic Byway. STERLING HIGHWAY The Sterling Highway is a 138-mile-long state highway in the south-central region of the U.S. state of Alaska, leading from the Seward Highway at Tern Lake Junction, 90 miles south of Anchorage, to Homer. STEESE HIGHWAY The Steese Highway is a highway in the Interior region of the U.S. state of Alaska that extends 161 miles from Fairbanks to Circle, a town on the Yukon River about 50 miles south of the Arctic Circle. Includes access to both the Chena Hot Springs Road and Circle Hot Springs Road. TAYLOR HIGHWAY The Taylor Highway is a highway in the U.S. state of Alaska that extends 160 miles from Tetlin Junction, about 11 miles south of Tok on the Alaska Highway, to Eagle. This is often called the "Top of the World" drive and is truly spectacular. The highway is narrow and winding, so allow plenty of time. Check out Chicken Gold Camp in the town of Chicken Alaska when traveling the Taylor Highway.